Why has “feminist” become a dirty word? Perhaps it is the outdated notion we are all men-hating, bra-burning rebels. 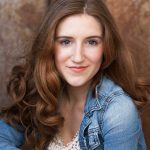 But why is it we have trapped outspoken young women to this confining stereotype? Today, A feminist comes dressed in jeans and a t-shirt and she’s labeled as unladylike, or lipstick and heels and her very speech becomes undermined by the way she chooses to dress. In truth, feminism is advocacy, not a certain aesthetic or bold attitude. As Merriam Webster Dictionary states, feminism is the advocacy of women’s rights on the basis of the equality of the sexes. Furthermore, I would like to point out that nowhere in this definition does it say the feminist movement is reserved for women. Gender equality is an issue for which we all hold responsibility; Every individual across the gender spectrum, across all political party affiliations, has a part in the movement towards equality. History has shown that one fight for equality inherently lights the spark for other movements towards justice. View this not as a fight for feminism, but a movement towards unity. Feminism has to be a shift in antiquated tradition. Feminism means revamping our economy, politics, and everyday society in regards to the way we treat gender. This will take the efforts of a very wide spectrum of individuals. 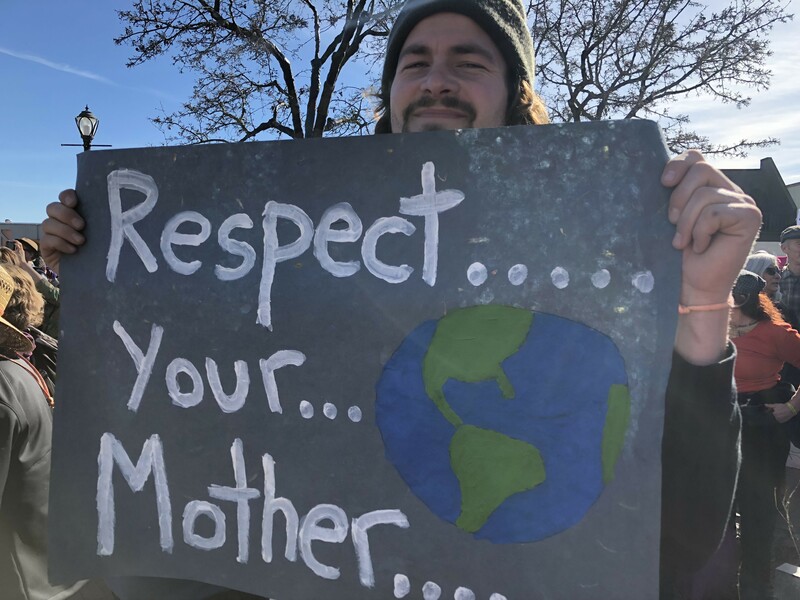 This is a movement of solidarity–the reason why we march. So I urge you to proudly don your feminist title, no matter your appearance, politics, religion, or gender. 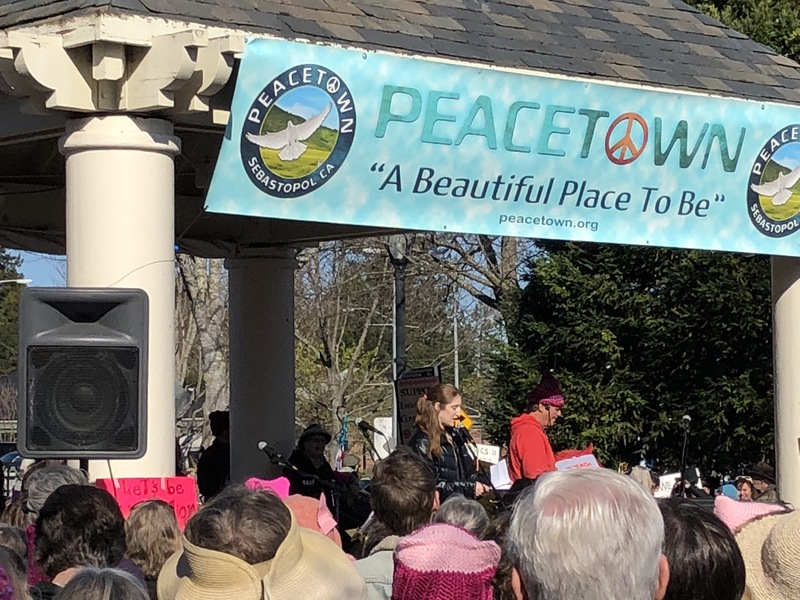 Analy High School Senior Mikaiya Gude talks to more than 1,000 participants crowding Sebastopol’s Town Square. 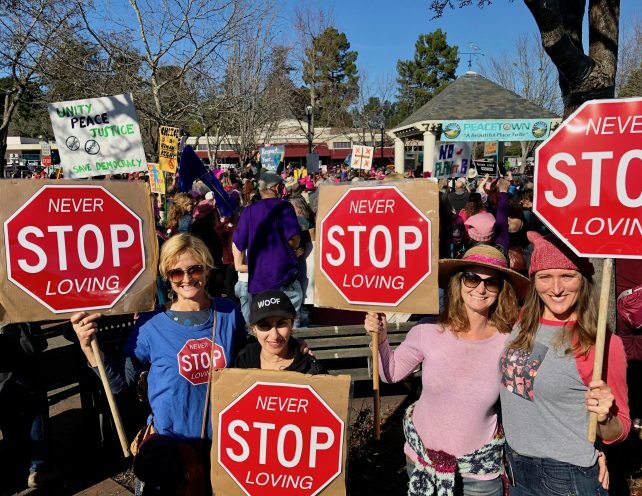 Photo by the Sonoma Independent. 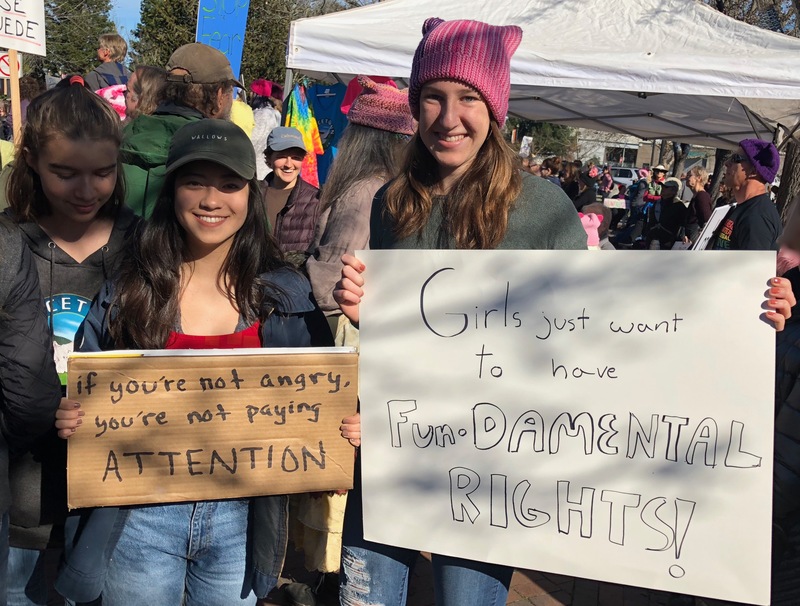 Sebastopol eighth graders have a message. 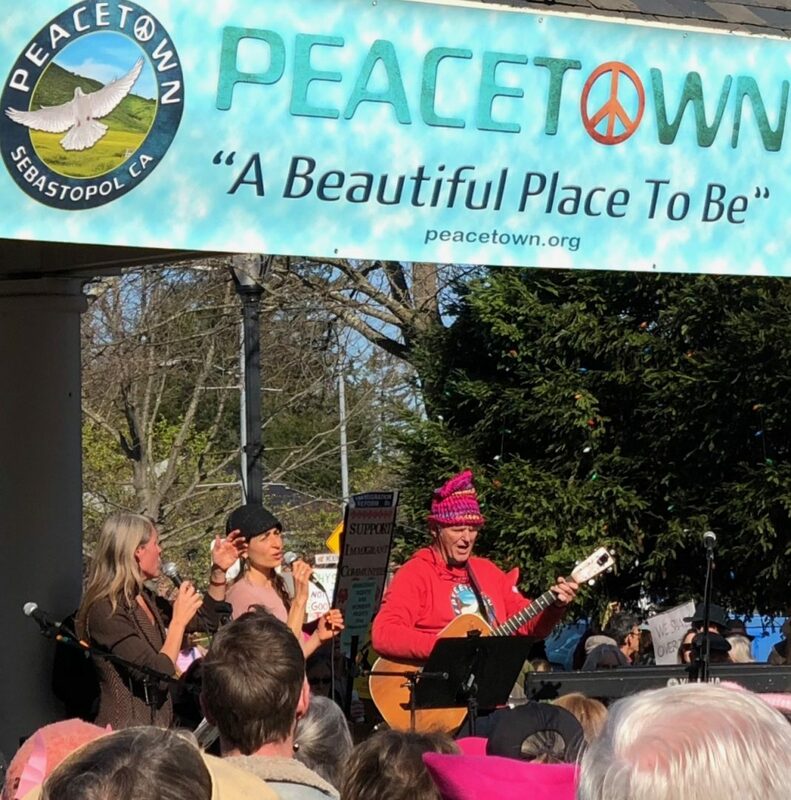 Photo by Sonoma Independent. 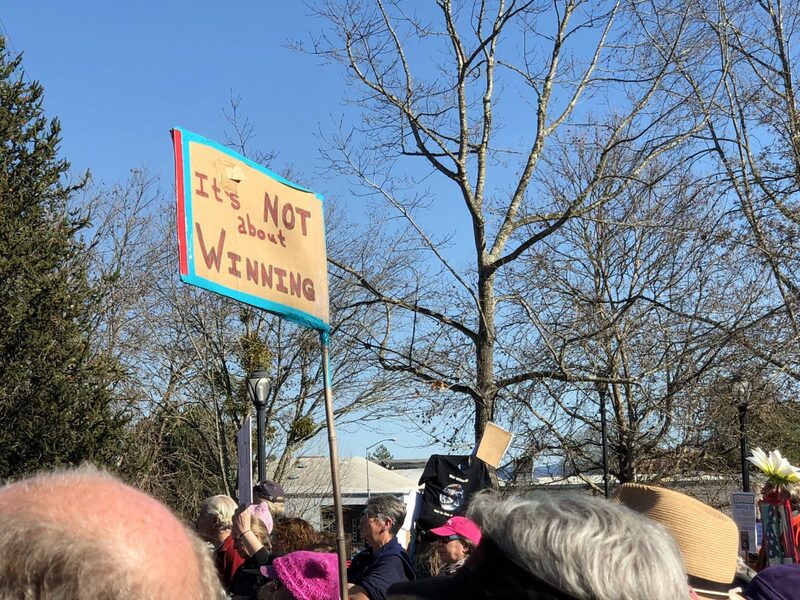 Sebastopol Women’s Rally. Photo by the Sonoma Independent. 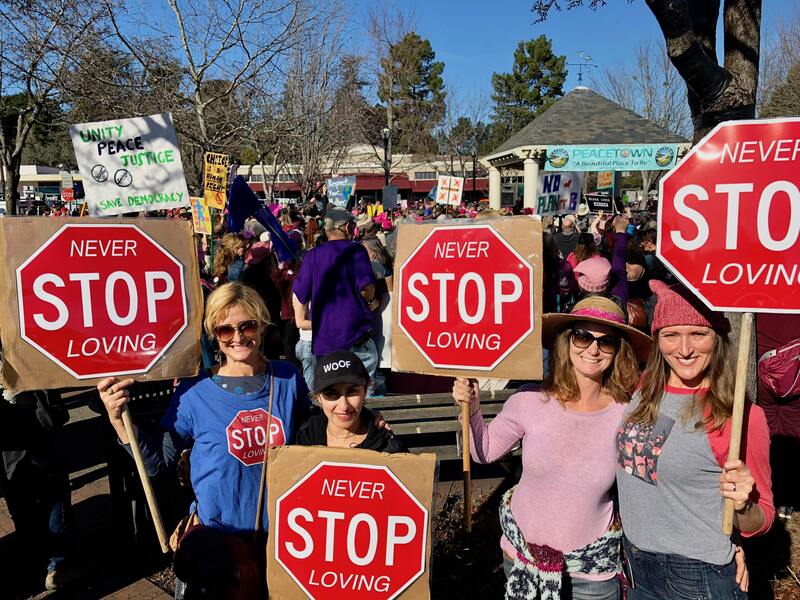 Sign of the times at Sebastopol’s women’s rally Jan 21. 2018. Photo by the Sonoma Independent. The legendary singing duo MaMuse, assisted by Mr. Music Jim Corbett, leads the crowd in communal song. Photo by the Sonoma Independent. West County moms focusing on the Big Picture. Photo by The Sonoma Independent.